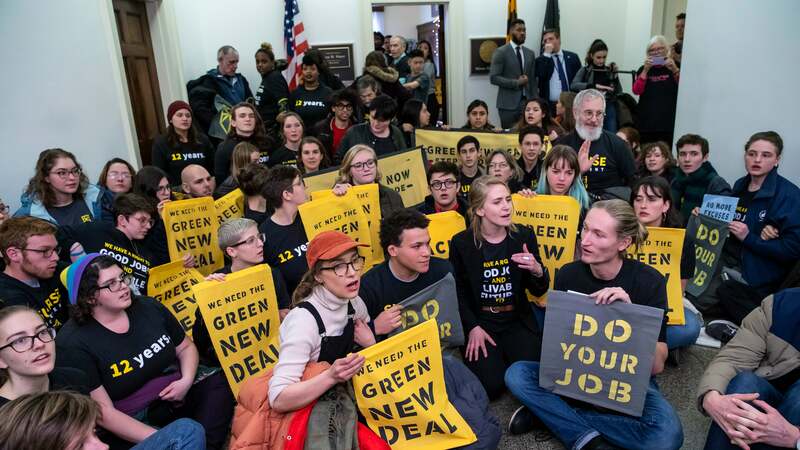 The Senate will be taking up a vote for the Green New Deal in what’s widely seen as a cynical ploy by Mitch McConnell to divide Democrats at the expense of millennials and future generations. The thing is, millennials are pretty pissed and they’re not going to let the vote happen without making some serious noise. The Sunrise Movement, a youth-led group that has championed the Green New Deal, is planning a host of actions over the next few weeks to turn up pressure on senators from both sides of the aisle ahead of the vote on the resolution released last week by Representative Alexandria Ocasio-Cortez and Senator Ed Markey. Then on Tuesday, Senate Majority Leader Mitch McConnell announced he would bring the Green New Deal resolution introduced to the floor. Without any committee hearings or Republican support, the intent isn’t good faith debate but rather one to embarrass or divide Democrats, some of whom have come out against it (cough, cough Joe Manchin) . It’s unclear when exactly the vote will go down, but in response, the Sunrise Movement is planning a series of escalating actions over the coming weeks. The group aggressively targeted Democrats in the House when pushing for a Green New Deal and a select committee to flesh out specific policies (an idea Nancy Pelosi, who has also been dismissive of the proposal, didn’t take up). But the next wave of actions are aimed at all 100 senators regardless of party affiliation. The Senate will be in recess next week and the Sunrise Movement is asking volunteers to flood state offices and call senators. When the Senate goes back in session the week after, Sunrise Movement is planning a national day of action including Senate office takeovers in Washington, D.C. The takeovers are designed to turn up pressure on Senators to vote yes and remind them that their vote could come back to haunt those up for re-election in 2020. Stephen O’Hanlon, the communications director for the Sunrise Movement, told Earther that “hundreds” have already signed up to take action. “Mitch McConnell is going to regret his sorry attempt to stop the Green New Deal,” Sunrise Movement co-founder Varshini Prakash said in a statement. Democrats are also using the vote as a chance to put Republicans on the record about their climate views. On Thursday, Democrats blasted Republicans for wasting everyone’s time and laid bare how bankrupt Republicans are on climate change. And that shows how the vote could actually cut against Republicans. Their intransigence is now wildly out of step with most Americans, and millennials in particular (to say nothing of the climate). McConnell is clearly counting on entropy to keep the Republican majority in place, but by going on the record against a popular set of policy proposals, Republicans—especially those in vulnerable seats — could face backlash in the 2020 election. Millennials, who are the largest group of eligible voters in the U.S. and will be most affected by climate change, are also likely to remember this when casting ballots in future elections. And that’s to say nothing of how future generations will look back on Republicans and this stunt.